Purchasing car rental insurance and protecting your rental car can be confusing and overwhelming. And in the midst of all the confusion, we tend to forget or overlook the boring details of car rental insurance. Here’s a checklist of 7 things for you to check when booking for your next roadtrip! When you rent a car, a basic/standard insurance cover is usually included in the booking. However, this standard insurance comes with a lot of exclusions which gives you little to no protection for your road trip. And this is where it can get tricky. Car rental companies are known to trick customers into buying their excess cover insurance which can cost up to $40. Getting an insurance policy from a standalone insurance provider (like RentalCover.com) can save you up to 40% of your money! Want to learn more? See our excess cover page and learn about other types of rental car insurance in the market. 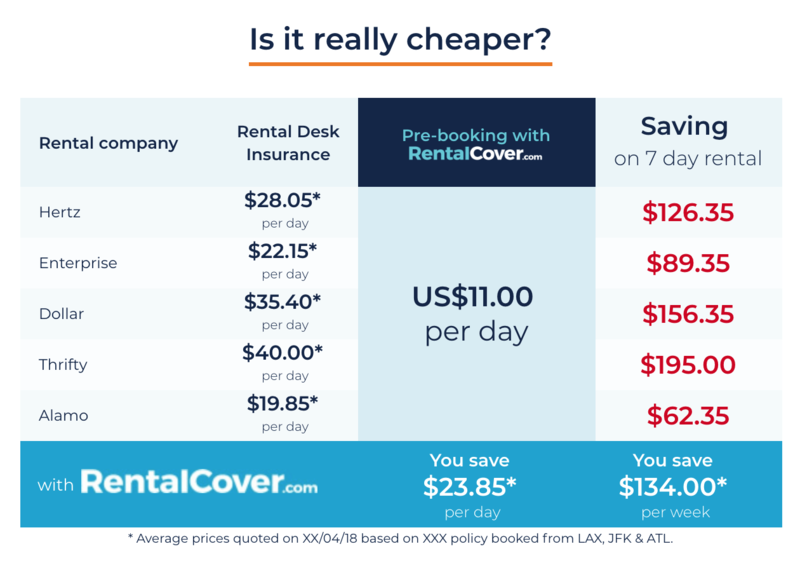 See how RentalCover.com compares with car rental companies. One of the most important things to watch out for when purchasing car rental insurance is to check what you’re covered for and what’s excluded from your insurance policy. The most common exclusions in car rental insurance are damage to the engine, tyres, wheels, roof, undercarriage, windows and mirrors. Another thing that’s hardly ever covered in basic car rental insurance is key coverage and lockout. So if you lose your keys or get locked out of your car, your insurance policy will not cover you. Similarly, if your car breaks down or you meet with an accident and in need of roadside assistance, chances are that your car rental insurance doesn’t cover you for that. Another thing to check when purchasing rental car insurance is whether or not you’re covered for roadside assistance. Most rental companies have a separate add-on insurance policy specifically for roadside assistance which costs up to $A7 per day. 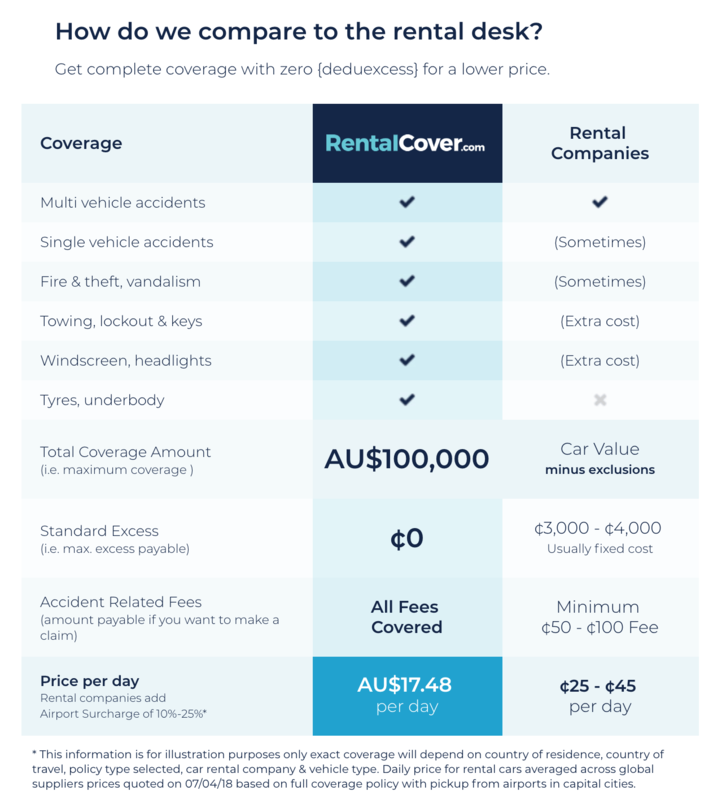 So if you were to rent a car for seven days and decide to get covered fully by purchasing rental insurance from your car rental company, you’d have to pay up to $280 for excess cover plus $49 for roadside assistance which is $329 for insurance alone! However, if you opt for a standalone insurance provider with comprehensive policies like RentalCover.com, you can get an insurance policy that covers you for everything, often more than the premium excess. The only downfall to purchasing car rental insurance from a standalone provider is that most car rental companies will require you to leave a security deposit with them, which is refunded back when you return the car. Therefore, make sure your credit card limit allows you to pay the deposit plus any other expenses you have planned for your trip. Plans tend to change - something urgent might come up, you might fall sick or you might find a better and cheaper deal! Whatever the reason might be, make sure you have the freedom to cancel or reschedule your trip - be it the car rental itself or the insurance you purchase for it. Always make sure to read the terms and conditions thoroughly before making any booking as these things are usually buried in the fine print and often are missed by most people. The world of car rental insurance is not black and white. There’s a lot of grey. A lot. Unfortunately, car rental insurance can be very scammy and that’s something we should all be wary of. Always make sure that the insurance provider is regulated. You can do this by reading the Policy wording or the Product disclosure statement. Make sure that the insurance you’re planning to purchase is valid for the type of vehicle you’re renting, your country of travel etc. 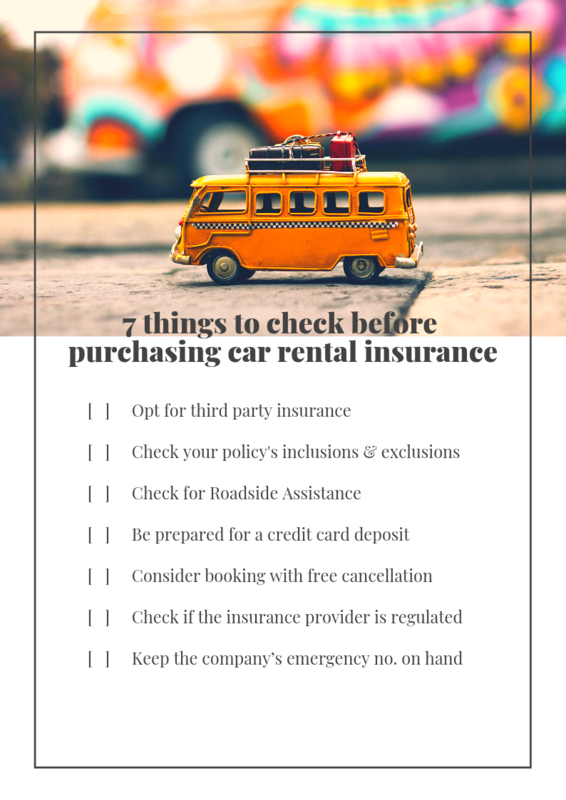 By doing so, you will also be prepared to handle the sales person at the rental desk who will try to sell their insurance policy by telling you that third party insurance is not valid or that it’s compulsory for you to purchase insurance from the car rental company etc. There’s no definitive guide to help you figure out what you need and what you should buy, except the car rental guide put together by RentalCover.com. It talks about all the different types of products offered in your country of travel and tells you what you need to at the rental desk or in the event of an accident. Lastly, make sure that you have the company’s emergency number with you. You don’t want to be stranded in the middle of a road with a broken down car and try to figure out who to reach out to and how. Be prepared and make sure to check if the listed emergency number on your policy statement or on the website is working and updated before you leave. It’s human tendency to make mistakes. But unfortunately, in the real world, making a tiny mistake can cost you thousands of dollars.